Just a quick post to share the resources from my CodeStock 2012 talks. The conference was a blast, but I don’t have time to do a full recap right now. I do want to say thank you to all who attended. Also, a huge thank you to Michael Neel for organizing the event and taking a chance on newer speakers. 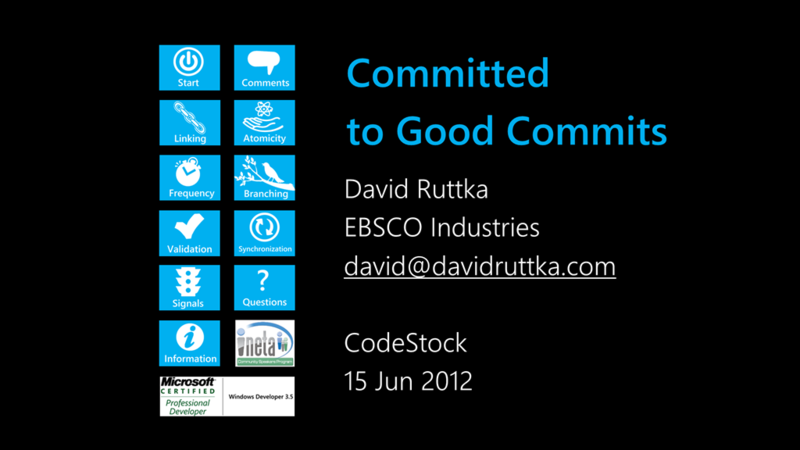 First, a replay of my Committed To Good Commits talk from TechMixer University. I updated the slides; while they still had a bit of a bullet point feel to them, they’re perhaps a bit prettier. You can get the pptx, pdf, or pdf with notes. There’s no code here, it’s all discussion. Ah, nothing like a verbose subtitle. 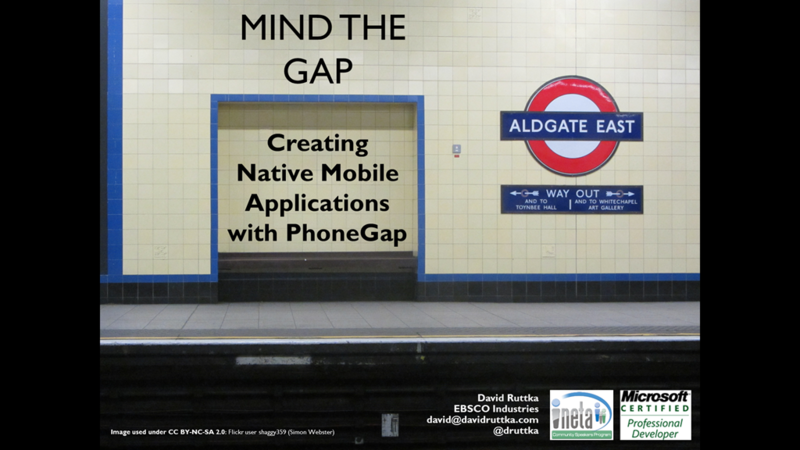 I was very excited to have a great turnout for this talk, and I hope that I delivered a useful and entertaining introduction to PhoneGap. Here are the pptx, pdf, and pdf with notes. As for the code samples, I showed the “example” projects that come with the PhoneGap downloads. And technically, while we didn’t look at the code for the following, I did reference my terrible, terrible hack to show-off PhoneGap Build. I did try, but a certain free screen recording software failed me twice. For Committed, it crashed while trying to mix the audio and video; for Mind the Gap, it wouldn’t even launch. Sorry about that.